The magic of a well-chosen pseudonym cannot be denied. Muddy Waters stuck in the mind at first because it was unusual- the music proved great, too. 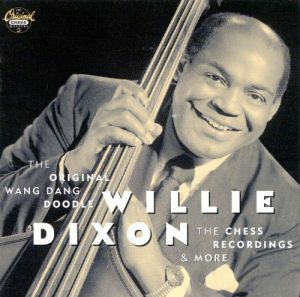 But Willie Dixon had to sneak up on you with his tremendous talent. Where is all this energy and feeling coming from? Who is this guy? Chess records? Tell me more. When faced with a songwriter of Dixon’s accomplishments, it is impossible to select a favorite- truth be told, Weak Brain, Narrow Mind just seemed too prescient. I have strong leanings toward Built for Comfort, in the running for my all time favorite tune. So, let’s talk about that one for a moment… The magic that is Willie Dixon songwriting is his incredible ability to encapsulate emotion so perfectly. The great tune-smiths have that, though few have equaled the shear volume of Dixon’s output, or the range of emotions that he placed inside his songs. I want to ask a question: if we are not listening to Willie Dixon and Cole Porter and David Ackles, then what are we doing with our ears? If you can’t recall the incredible moment you first heard Fela Kuti or E.T Mensah, then what are we doing here? That only scratches the surface of a world populated with the music of Wolfgang Mozart and Mohammed Rafi. All right- that was an awfully high horse. The nature of a blog on favorite music, literature, and other arts tends to cause one to wallow in a lot of things that normally attract only passing interest (if that). Years ago, a young man confronted me. He wanted to become a professional writer. I was unprepared for the question because I had not then (or even now) accomplished enough to justify any expectation that I know much. So, I asked what he wanted to write. Greeted with no clear interest, I asked what he liked to read. He didn’t like to read and didn’t see how that had any bearing. I thought he was pulling my leg, but a little probing proved that was not the case. Art looked easy from the outside. Let’s face facts- it takes some arrogance to create art for sharing (for example, in a blog). Usually, that arrogance comes along with a certainty that you know something that no one else does. But I don’t think we can ignore the world of creativity around us for the easy path, either via mediocrity or intentional ignorance. You’ve Got to Check This Out is a blog series about music, words, and all sorts of artistic matters. It started with an explanation. 230 more to go.